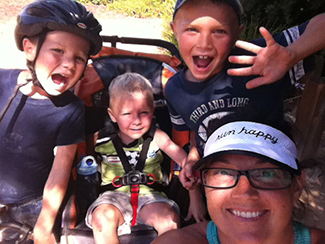 As a mom of three active boys, finding time to workout at home is a constant juggle. I find myself waking before the sun or wrestling three little monkeys as I attempt to workout at home. Running and biking on the trail are great to do as a family… but there is something about exercising without being “MOM”. One of my favorite things about my membership at California Family Fitness is the excellent child care they provide. I love how they know my children by name. I am comforted by the fact that the staff gets my children’s quirky personalities and jokes. I feel safe knowing that they are taken care of by well-trained staff. Besides the awesomeness of the child care staff, my boys love it there. They love playing games with the teachers, doing crafts, and enjoying the free play with their gym mates. It is nice to not have to drag my children to the gym, because they enjoy going. They have a great time being kids… while mommy enjoys being away from her kids. On the motherhood side of things, I love the childcare because it gives me a much needed break from my children. I love them. I love working out with them. I love that they see me valuing health and fitness. But sometimes this mama wants to run, lift, stretch, or just sit by the pool… alone. Children are great imitators. They SEE more clearly what we DO more than what we SAY. We need to give them something to imitate. Whether the imitation is working out together as a family, or showing the importance of making Mommy a priority. Putting the ME back in Mommy. I love the child care at California Family Fitness. I love that my children love it too. The membership fee is worth it knowing that my children are well cared for while I enjoy an excellent SOLO workout.